Edwards are a world leader in the design, technology and manufacture of (dry) vacuum pumps for process applications, tailoring solutions to our customers’ needs. For 100 years Edwards has been at the forefront of vacuum pump technology, helping make manufacturing cleaner, smarter, economical and environmentally friendly. Edwards’ chemical and industrial vacuum pumps are integral to manufacturing processes for an increasingly diverse range of industries including Chemical Process Industries, Power, Glass and other Coating applications, Petrochemicals, Plastics and Recycling, Steel and Metallurgy applications and Pharmaceutical industries. 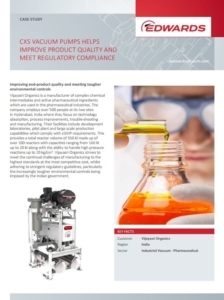 Edwards has developed comprehensive dry vacuum systems and solutions for Chemical Process Industries to address challenges unique to the industry. 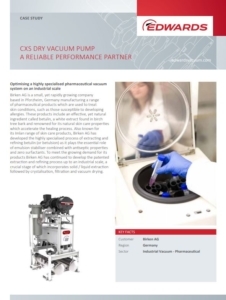 Their pioneering dry vacuum technology provides real cost benefits and environmentally friendly operations. 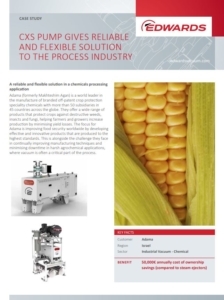 Edwards’ combination of chemical applications expertise, product portfolio, engineering strength and global service presence puts them in a unique position to be able to work with you to design the best solution for your chemical process.